Like the Captain Planet crew, three of geek entertainment’s biggest players have joined together to summon a superhero. Seth Rogen and Evan Goldberg are writing, directing, and producing a movie adaptation of The Walking Dead creator Robert Kirkman’s long-running comics series Invincible, which was co-created by Cory Walker and is currently illustrated by Ryan Ottley. Continuously published by Image Comics since 2003, the tale follows Mark Grayson, who begins his saga as the superpowered teenage son of his world’s most powerful caped crusader, Omni-Man. The setup borrows from Spider-Man and Superman, of course, but what has set it apart has been the fact that it’s both a superhero story and a commentary on such stories, self-awarely poking at and exploring the genre’s tropes and traditions. Goldberg, Rogen, and Kirkman are doing the film with Universal Pictures, and will be joined by three other important folks their orbit: Kirkman collaborators David Alpert, Bryan Furst, and Sean Furst. 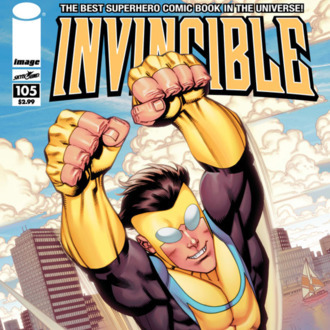 For years, readers have wondered when the eminently filmable Invincible would make it to the big or small screen, and Kirkman has used the first-look deal that his company Skybound has with Universal to assemble something of a dream team of savvy nerds. Between the success of their Preacher on AMC and their snatching up of other comics properties such as Garth Ennis and Darick Robertson’s The Boys for a Cinemax series, Rogen and Goldberg are emerging as titans of Geek Hollywood. This is also a big deal due to the fact that it’s going to be a high-profile superhero-comics adaptation not based on a Marvel or DC character. It’s a solid idea, but only time will tell whether it’s invincible or vincible.